Marine Cargo Operations clearly instructs merchant officers with the techniques of cargo operations and the principles of stowage and their application. Based on the author's half century of experience, the book singles out the most practical methods, procedures, and philosophies and presents them in thorough detail. Over 160 photographs and drawings enhance these discussions. The book provides a complete understanding of the shipping cycle so all associated personnel can work as a team in observing the "three Cs" of shipping: communication, cooperation and coordination. The fourth edition emphasizes innovation sin cargo operations over the last five decades, particularly containerization and the responsibilities of the ship's officers for the proper and safe carriage of their cargo. 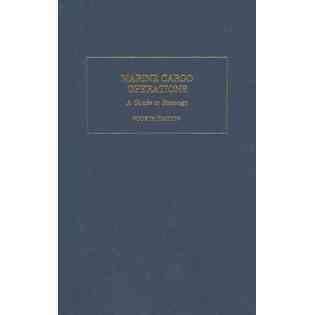 Chapters include discussions on innovations to carriage of goods at sea, cargo responsibility, materials handling and stowage principles, planning the stowage and preparing cargo spaces, stowage of general and hazardous cargo, proper cargo care and hold ventilation, and marine materials handling equipment. This edition provides vital information for candidates taking a U.S. Merchant Marine license examination, and is an important refresher for those who have already received their licenses.